The eagerly anticipated Roy Lichtenstein art retrospective is arriving at the Tate Modern on February 21st. The retrospective celebrates the works of one of the greatest American artists of the 20th century and is the first full-scale retrospective of his iconic work in over twenty years. The retrospective has been organised in collaboration with the Art Institute of Chicago and brings together 125 of Lichtenstein’s most definitive paintings and sculptures. Lichtenstein is known for his comic-strip style prints, created with his signature hand-painted Benday dots that defined the mid 20th century pop-art culture in which he lived. The exhibition at the Tate Modern will showcase some of his key paintings, including arguably his most definitive work, Whaam!, a highlight of the Tate’s collection. The Roy Lichtenstein retrospective will also lead the way for a number of pop-art and Lichtenstein-centred events taking place at the Tate Modern throughout the next few months. Wham! Print! Pop! Is a specialist workshop in which participants will be invited to explore the graphic style and landscapes of Lichtenstein’s iconic paintings in a five-week, artist led course. This workshop will be very hands on, allowing you to gain insight into Lichtenstein’s signature pop art compositions and methods using methods such as screenprinting, assemblage and collage. The course is great for any budding artists, or those who enjoy painting as a hobby and you will be able to develop your own Lichtenstein-style work by the end of this course. There will also be the opportunity to attend a private viewing with a talk by the curator, as well as a number of seminars on the genre of pop art throughout the duration of the exhibition. This is a must-see event of 2013. 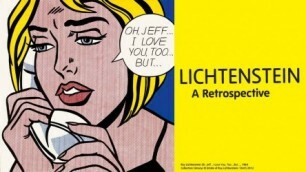 Lichtenstein: A Retrospective opens 21 February – 27 May 2013 at the Tate Modern. Click here for information on the David Bowie exhibition at The V&A.